One of the reasons I enjoy New Orleans and the surrounding area so much is because of its history. The area is very rich in culture, as it is one of the oldest cities in the United States. One of the best ways to experience the history of the New Orleans and Baton Rouge area is to visit the plantation homes that still exist along the Great River Road. During our last trip to New Orleans, we took the short drive to the San Francisco Plantation. Today, the plantation sits on a small piece of land that is well landscaped and with an event building, a small gift shop and two slave cabins. The area is surrounded by fencing as well as an oil/gas plant. At first it is a bit odd looking and the home looks to be out of place, but upon further investigation you learn that the plantation itself was bought by the Marathon Oil Company. 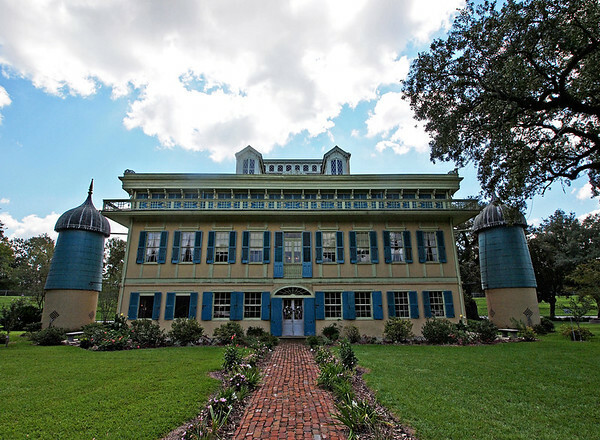 It appears that the company carved out just enough space for the grounds of the home and to create the San Francisco Plantation Foundation, which now maintains the home and operates the daily tours and events. Although the setting is a little out of place at first, as you walk around the grounds and the gardens, you don’t pay as much attention to the surroundings outside of the area and you focus on the historical place you are standing near. The front yard itself was sacrificed when the new levee system was built to control the Mississippi River. The home itself was originally built by Edward Marmillion so that his sons would have a prestigious home on his sugar plantation that had only just become a success in the 1850s. Unfortunately Edward died just a year after the home was completed. His son Valsin returned to the plantation “sans fruscins” or “without a penny in his pocket.” Thus, the name of the plantation was created – the San Francisco Plantation. The home has been restored to its original Creole-style glory after several decades of new ownership and modifications. Experts were brought in to search the grounds for clues of the original paint colors in order to date the home and determine its original style and features. The entire home from the ceiling joists to the cobblestone floors were restored and brought back to life. However, over the years the furnishings were lost and the home is now furnished with items that are representative of what would have been in a plantation home in the 1800s. The guides are dressed in period clothing and very knowledgeable. I can’t remember the name of our guide, but she was kind enough to let me take her picture in the house at the end of the tour. She was very knowledgeable about the history of the home and the families that had lived there. 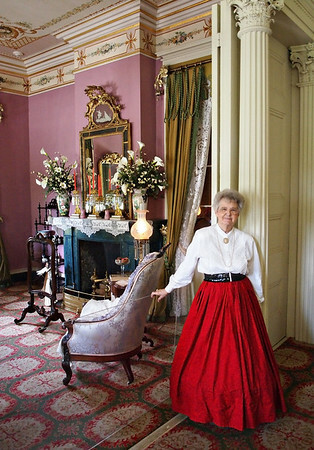 She knew details about the home as well as several of the other plantations in the area. We thoroughly enjoyed our tour with her. However, she did have a very thick Cajunesque accent. She spoke French very well as well as some German, as many of the families along the Mississippi River were actually Germans that changed their names to French names. The interior of the house features exposed ceiling beams on the first floor of the home and in the pantry/food storage rooms, they had running water from the cisterns that stand outside the home. This area also includes barrels buried in the floor, which were one of the first forms of refrigeration. The first floor of the home was very functional and mainly used for storage with the dining room on this floor as well. The wine storage room on the other side of the home also had running water. The family actually lived on the second floor of the home. This is where you find many of the exquisite details of the home. We were told that the second floor was cooler than the first floor. They were able to open the windows to create a cross breeze through the second floor. The bedrooms were in the four corners of the home with two living spaces in between as well as an entry room in the middle. The home actually contains several “faux” details throughout. Much of the marble detail is actually painted cypress wood that has been treated to appear as marble. Many wood details are also cheaper cypress wood that has been treated. Throughout the second floor you have many delicate paintings and frescoes on the ceilings and the doors. All of these details were painted by artisans of the day that have since been restored and recreated where necessary. This home is very different from many of the plantation homes in the area, especially the bright blue and peach colors of the exterior paint. I would definitely recommend touring this house and after the tour be sure to walk around the entire house. There are two small patio areas on the front side of the home, with one of those containing a unique fountain that contains live goldfish. It’s certainly a delightful and unique accent to the home. After you have toured the home, take the time to visit the slave houses near the gift shop. One of them is open so that you can walk through them and see their size and artifacts. The houses appear to have once been painted on the inside with leftover paint from the big house, as the walls have a teal tint to them. The other house is roped off so that you can see into the house, you just can’t walk around in it. I would definitely recommend visiting this home. We visited during a weekday and there was only one other visitor in our tour, allowing us to have a very intimate and informational tour. I’ve seen many complain about the location of the home being surrounded by an industrial plant, but I promise that once you’re there touring the grounds, you won’t even realize the plant is there. You can learn more about the plantation at http://www.sanfranciscoplantation.org. Admission for adults is $15 and the gates open at 9:30am.